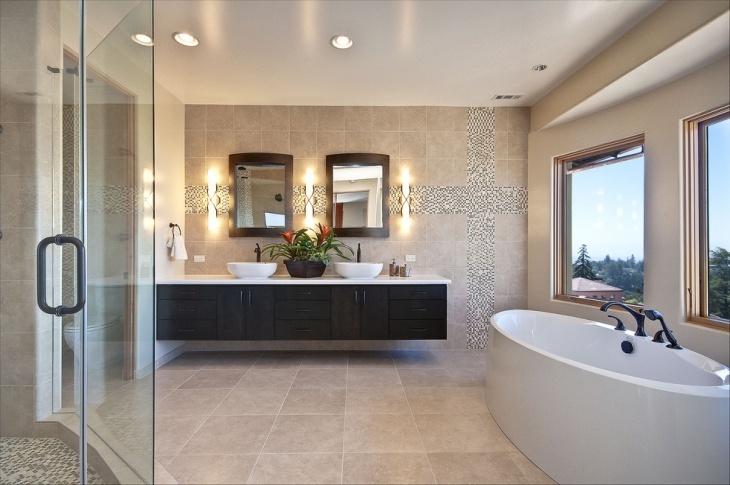 Looking for unique ideas to create a contemporary master bathroom in your premises? We have collected a few examples from across the internet that you might want to check out. 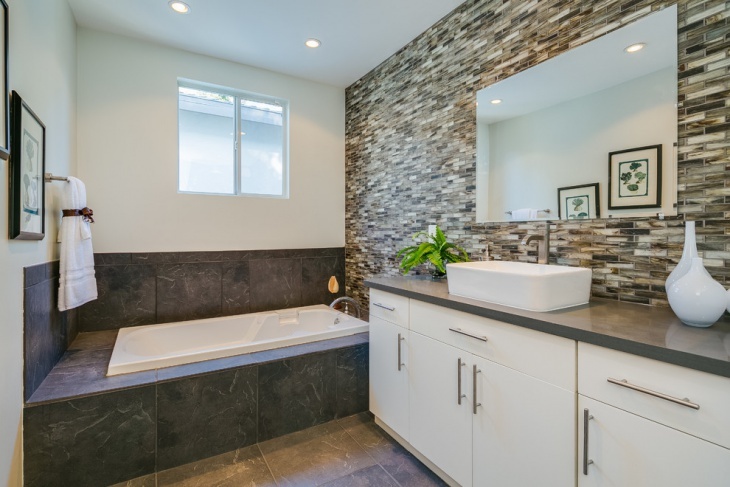 The basic idea about a contemporary design to your master bathroom would be creating a relaxing retreat with the use of contrasting colors and textures. 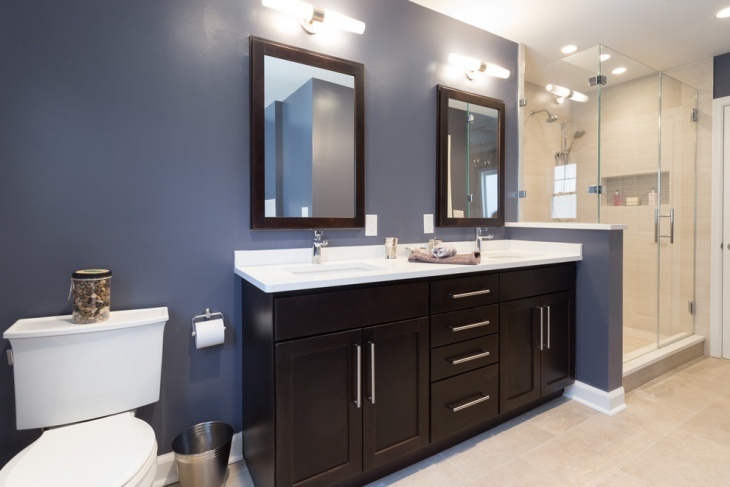 Fully equipped, the master bathroom is supposed to be the grandest and deserves the dreamiest looks! 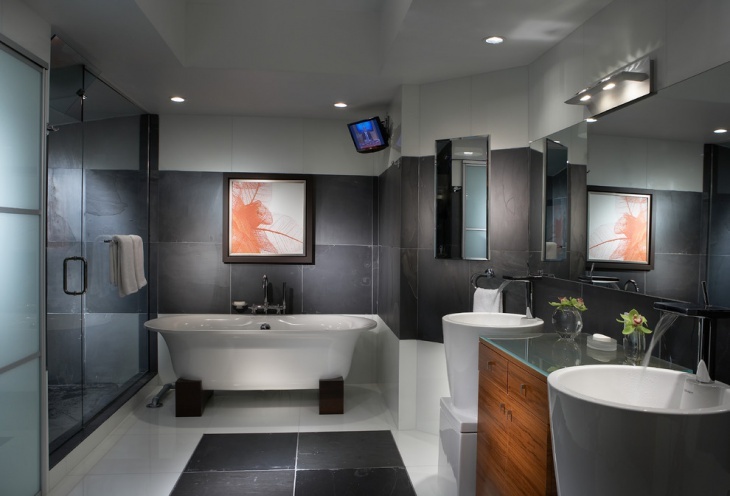 Who said that bathrooms cannot be colorfully luxurious? A themed contrast with blue glass and dark tile work can do well to beef up the space. 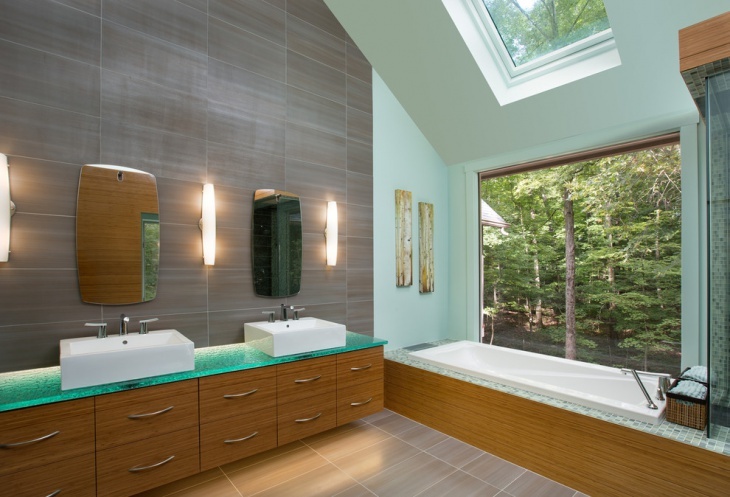 The use of big glass, be it for the sink mirror or the shower space separator will be more than functionality. 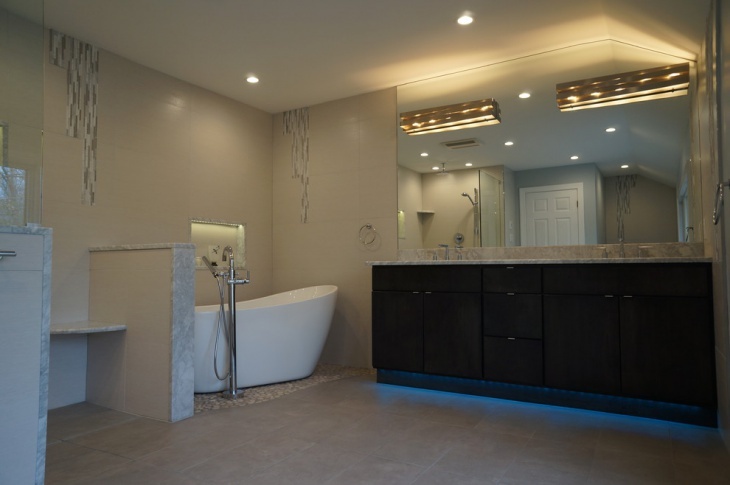 Ambient lighting is the final element that makes the master bathroom look grand. From the door knobs to the frame mirrors and the wall scones, everything needs to reflect the touch of preciseness. As opposed to a single lighting source for the whole space, several small and warm installations will bring out the traditional appeal while keeping up with the modern demands. 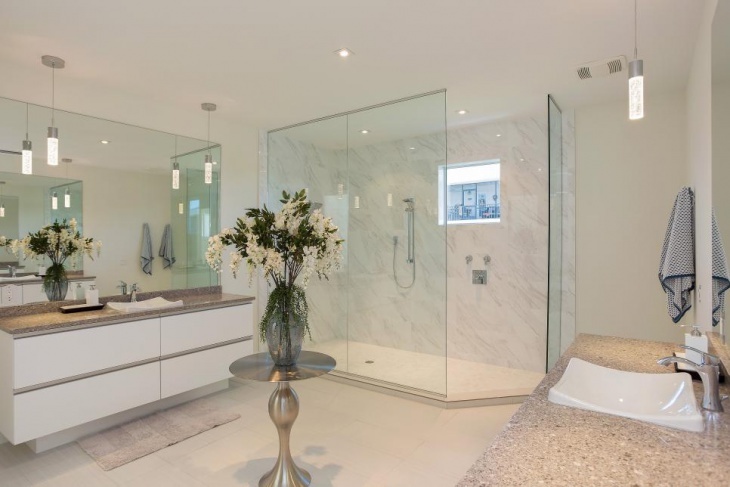 Clean lighting and bright bath is well supported by white marble and a lot of glass work. Perfect for any modern couple there is freshness and great style to this well equipped and decorated master bathroom. The use of natural flower pots and ambient lighting in the corners makes the room feel bigger. 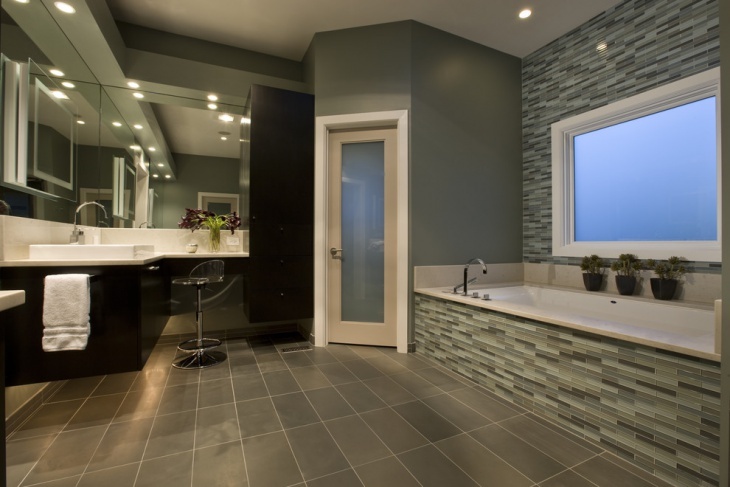 This is a perfect contemporary design scheme for master bathroom. Using the right crisp colors and lighting, you will be able to create a warm ambience. 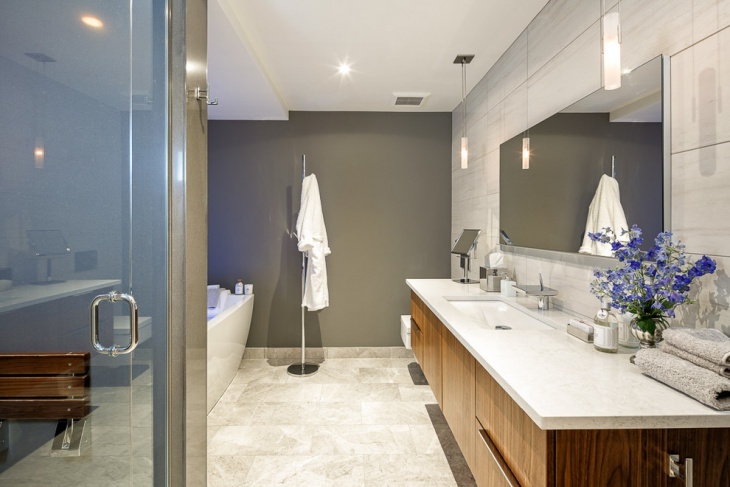 Elements like the ceiling water tap and tiled showers will make it feel luxurious and yet cozy. In mood for the exotic? 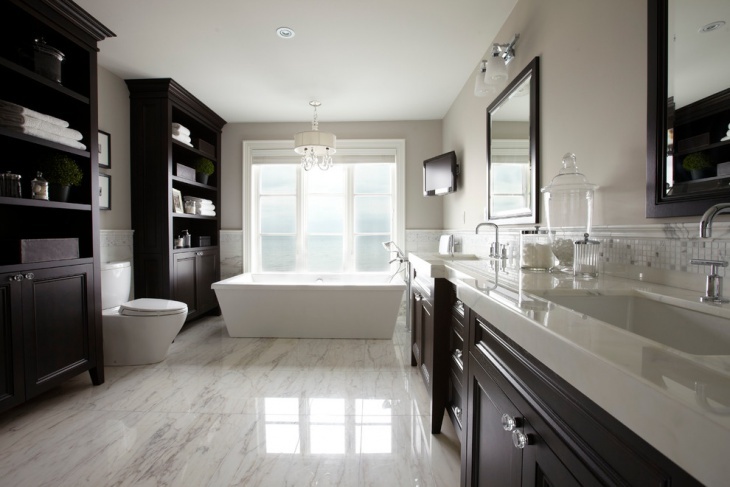 This completely dark scheme for a master bathroom actually looks very elegant and can be a dream project. The balance created by big gray tiles, the charcoal borders and the white furnishing looks classy in every aspect. Some abstract paintings on the wall would be great addition to the theme. 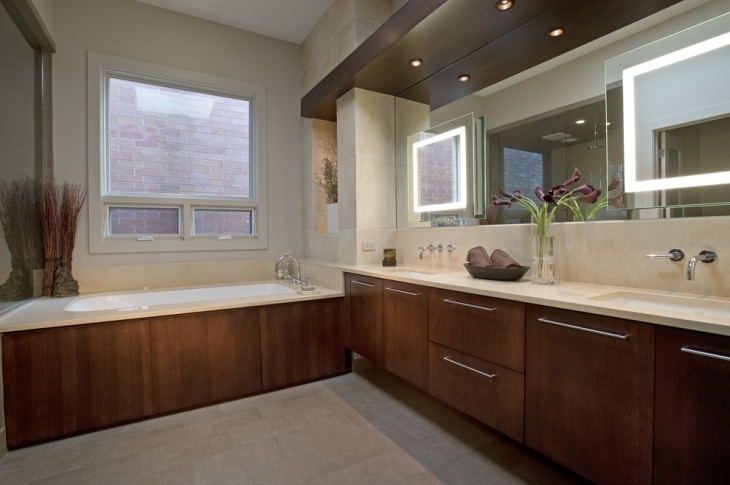 If you are passionate about dark bathroom schemes, you will be flattered with this dark coffee colored cabinetry. Balanced well by lighter mosaic and white furnishing, this would be a highly luxurious project. Evoking the essence of rustic traditional home designing, it would be perfect for any couple looking for the best. 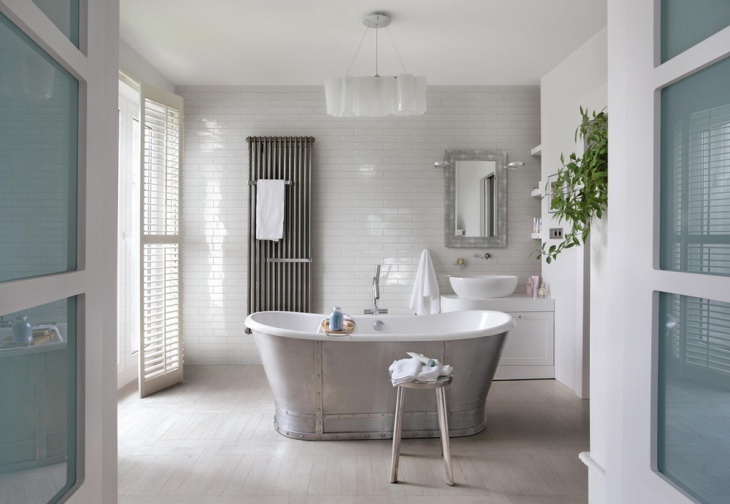 Bathroom designing can be fun too and doesn’t always need to be coined with words like contemporary or traditional. A good example would be this beach styled master bathroom. The colors of the sand and the sea come alive with effective use of tiling, lighting and woodwork. Putting in décor elements like pebbles, shell vases and similar other things will add to the mood. 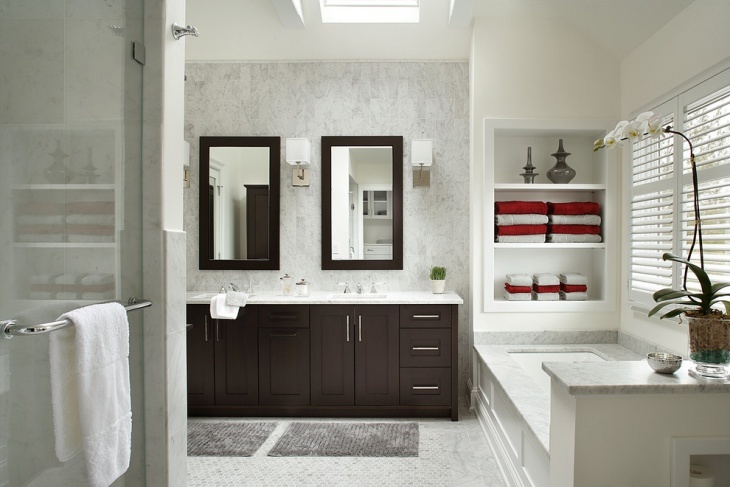 Spacious and simple, this bathroom adheres to plain inlays and smooth paint work. 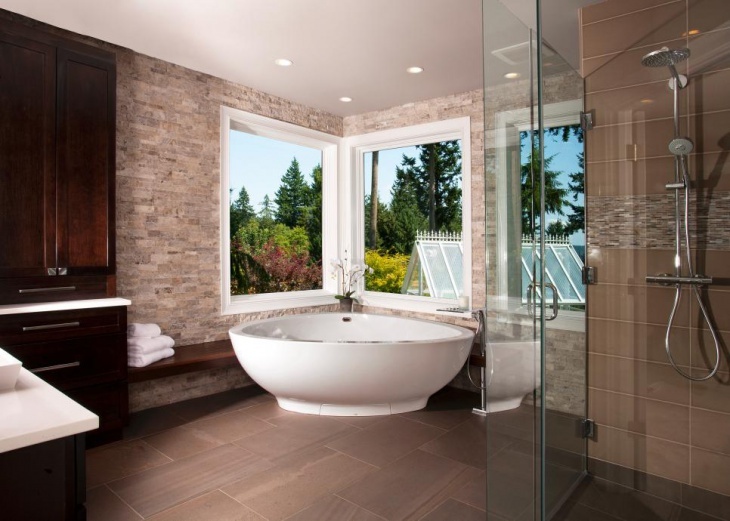 Sticking to the very basic necessity and not blowing it up is the basic idea for this beautiful modern bathroom. The arrangement of individual elements like the bathtub can have a lot of say in the overall mood of your master bathroom. Kept in a corner, this particular scheme doesn’t just look comfortable but also frees up a lot of space. Perfect for young couples! 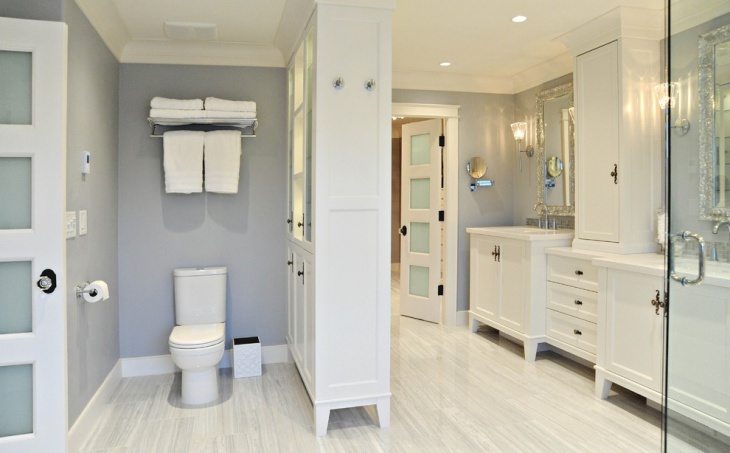 This bathroom scheme follows a simple yet elegant décor scheme and arrangement. Granite countertop is balanced with streamlined tiling to create a contemporary look. Installations like marble showers will also beef up the available space and helps disperse from a single source of light. 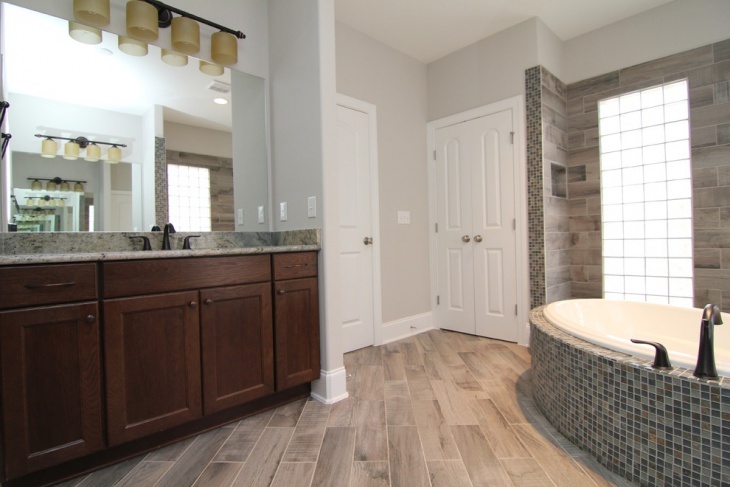 We hope that you liked our ideas for master bathroom. If you have something unique to share on these lines, we would be glad to hear!